Not your every day burger joint – that was the goal in conceptualizing the new Bin 4 Burger Lounge restaurant design and branding. We wanted to create a contemporary space that you would want to go out for a nice dinner to, or take the whole family, that was higher-end than your typical burger spot yet still comfortable. Granite clad counters, grey-toned wood slat walls and large wall graphics set the tone for the space. Booths and banquettes are wrapped in a bold stripe highlighting the signature warm grey and bright yellow synonymous with Bin 4. Modern lighting including Modernica bubble lamps and Bocci glass pendant lights add a contemporary feel while creating a warm glow. The stripes in the logo are carried through the signage, window decals and business collateral. Our team designs everything from the menus, to business cards, to take out bags and monthly feature sheets. 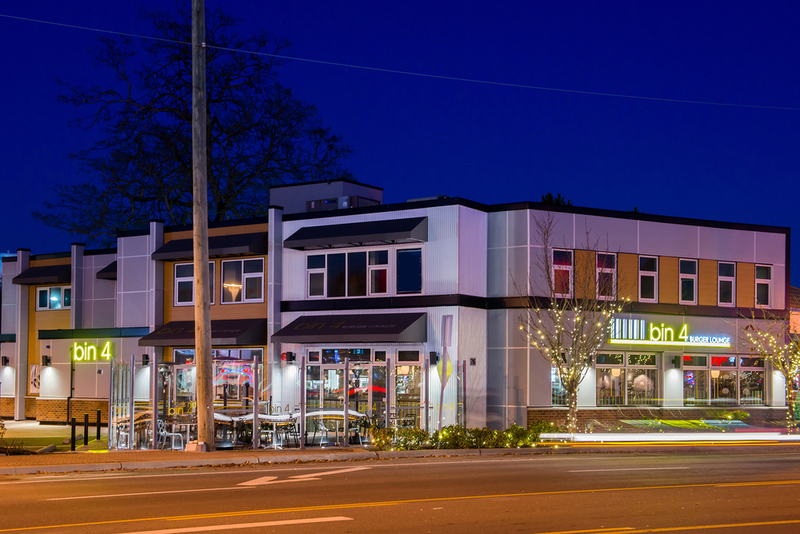 With the success of the first location in downtown Victoria, a second location was opened in Langford and was recipient of a Commercial Building Award in 2013. A third location has just been completed solidifying Bin 4 Burger lounge as a heavy weight on the burger scene.